The best teams in college football win in myriad ways. Blowouts mixed with consistent victories, blended with nailbiting survivals and comebacks. Yet again, Alabama showed America why it is the class of college football in a massive comeback win over Ole Miss. In Oxford. When they were down 24-3 in the first half. Against an Ole Miss team that has been their kryptonite in recent years, the Tide found a way to turn the tables despite playing poorly for much of the game. The Crimson Tide were torn to pieces by 421 passing yards courtesy of Chad Kelly, and gave up a defensive touchdown as well as 43 points to the Rebels, the same number as last year’s loss in Tuscaloosa. The Tide got by thanks to a monster day running the ball, and Jalen Hurts fully taking control of the Bama offense. Hurts led the Tide’s 334-yard rushing attack with 146 of his own, but it was his timely throws that showed he had the confidence, and skill, to pull his team out of the valley and back to the mountaintop. The last two weeks, by Nick Saban’s admission, the Tide have not played at their best. In those games they hung 38 points on a good, game Western Kentucky team, and tonight the Tide dropped 48 on Ole Miss in Oxford. This is the Tide at their worst, and they’re nearly unbeatable. At their best this team has no ceiling. Alabama played brilliantly to come from behind and defeat the Rebels, and it does not take away the fact that Mississippi’s loss falls squarely at the feet of Hugh Freeze and the moronic notion of conventional wisdom. After the opening week destruction at the hands of Florida State, the Rebels had a chance for a massive win, and rebound, against the Tide. With opportunities to make a statement, and show faith in his team, Freeze chose instead to play it “safe” and turned a potential W into a definite L.
With Alabama up 27-24 and less than two minutes left in the third, Ole Miss had a fourth-and-one inside Bama’s one-yard line. The Rebels were in the midst of a 75-yard drive in which Kelly had thrown for 66 yards. Instead of going for broke, having faith in his star quarterback, and showing that he wanted to win, Freeze chose for an 18-yard field goal. 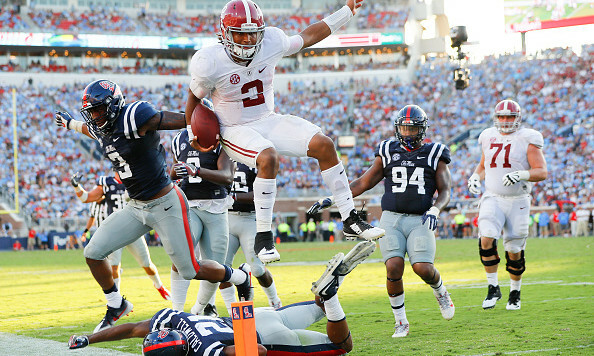 The very next possession, with Bama now up 34-27, the Rebels faced a fourth-and-three from Bama’s 21-yard line. Instead of going Freeze chose again for the field goal. By the time Ole Miss next scored they were down 18 points, and the game was effectively out of reach. Why Freeze, in his home stadium, with the top team in the country on the ropes, chose a passive route instead of actively working towards victory, was confusing at best, and self-destructive at worst. Again, this Alabama team put up 48 points and wasn’t even playing its best football. You have to go for the win in those situations. Freeze didn’t and was rewarded with the consequences. Those eight potential points given up would have been the difference in the game. Regardless of whether or not the Rebels would have converted on the opportunities, the fact that Freeze didn’t even let his team try was poor coaching. If you don’t play to win, others will. And if the players are, but the coaches aren’t, the season will derail quickly. Mississippi will have a chance to get back on track the next two weeks with home games against Georgia and Memphis, and they will need need those wins if they want 2016 to be a successful season.